Iraq sits on top of more than 140 billion barrels of oil, making it the owner of the world’s fifth largest reserves. When the United States invaded in 2003, the Bush Administration promised that oil revenue would be used to rebuild and democratize the country. But fifteen years later, those dreams have been shattered. The Iraqi economy has flatlined, millions of people are internally displaced, and international institutions have had to provide billions of dollars in assistance to the country every year. Where did all the oil revenue go? Reporter Erin Banco traveled to oil-rich Iraqi Kurdistan–an autonomous region that holds, according to the regional government, some 45 billion barrels of crude–to uncover how widespread corruption, tribal cronyism, kickbacks to political parties, and the war with ISIS have contributed to the plundering of Iraq’s oil wealth. The region’s economy and political stability have been on the brink of collapse, and local people are suffering. 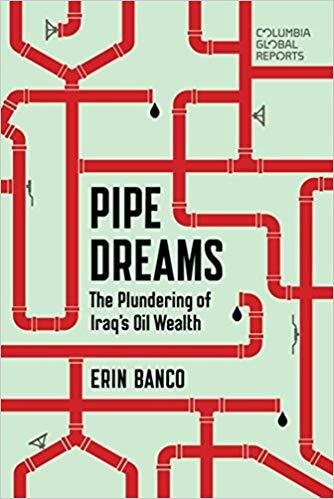 Based on court documents and on exclusive interviews with sources who have investigated energy companies and their dealings with government officials, Pipe Dreams is a cautionary tale that reveals how the dream of an oil-financed, American-style democracy in Iraqi Kurdistan now looks like a completely unrealistic fantasy.